Are you looking for a best mattress that can improve your quality of sleep but still has trending and compelling styles and designs? In today’s mattress review, we are going to introduce a name that has such great mattresses as being said. 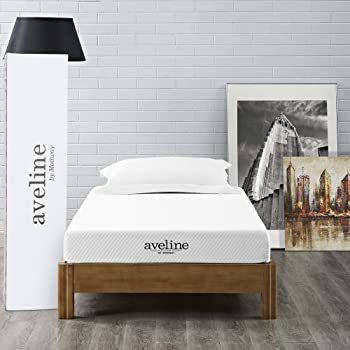 It is Modway Aveline Mattress, and its great best mattresses of all types. Let’s discover more as below. You can read more https://www.smartmompicks.com/best-mattress-under-1000/ at here. Modway is company and a major distributor of office, outdoor, living room, dinning, bar, bedroom furniture. This means this company isn’t limited itself to mattresses, it manufactures a wide range of items. This company has its distribution warehouses in different states of USA such as New Jersey, and Fontana, California and showroom located in Las Vegas NV, high point, NC and Miami Florida. There are different reasons people go for a certain mattress company, here are the popular reasons buyers go for Modway mattresses. Most of Modway mattresses are super affordable. Many of them come at under $200, which is fairly cheap to get as compared to others. However, it doesn’t mean the prices also equal its quality. Many models of Modway mattresses are indeed good in providing comfort and support. Moreover, they don’t look cheap at all. So, don’t underrate them! Modway also offers different types of mattresses, ranging from memory foam mattresses to hybrid mattresses. so, whatever type of mattress you are into, you will be easy to have your right option. Furthermore, Modway also gives you the different options for thickness levels, this allows you to find your preference for thickness easily. Sleeping cool is one of the important factors to consider when people shop a new mattress. Especially, this becomes more important if people plan on buying a foam mattress that is more likely to absorb heat. In reality, many cheap memory foam mattresses produce warm feel during the night. This cause may be the lack of cooling gel infusion during manufacturing process. The fact is Modway uses gel infusion as the way to treat heat retention in foam in many their foam mattresses, though, they just comes in super cheap prices. We know that buying a new mattress can take you a lot of time, and we want to help you with this following list. We call the best-selling Modway mattresses. It means we have already narrowed down to the top five best mattresses from this company, so you can be easier to find out the right one that suits your needs and preference. If you are back or side sleepers, this model may suit your taste. It is fairly soft and nice in feel. However, if you are an overweight person, you may need other mattresses to consider. 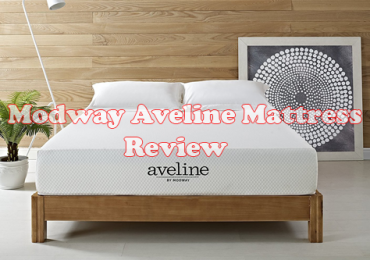 The Modway Aveline 8″ mattress is simply constructed from two layers of foam. The top is 2” Gel-Infused Memory Foam, which helps to keep heat retention under control. And, the bottom layer is 6” High Density Foam that acts a strong base and provide the shape to the mattress. The fabric used is a stretch knit type that zippers closed to ensure the foams stay intact. The fabric is also breathable and soft to feel. All factors are good in improving comfortable feeling for sleepers. Aesthetically speaking, it looks nice in its white tone and the diamond-design. 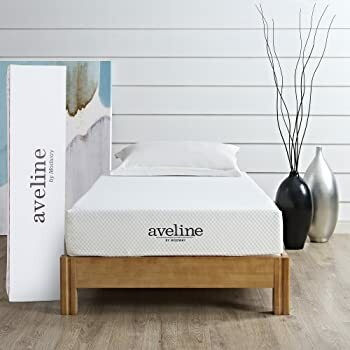 As the common feature of all-foam mattresses, this Modway Aveline 8″ is good at providing contour and sinkage. It also creates deeper sinkage than other types of mattresses. If you weigh from 150 – 250 pounds, you won’t be stuck in there. Instead, you will just feel the moderate firmness. How about edge support? All-foam mattresses aren’t generally good at providing strong edge support, and there is no exception to this mattress. Nicely, Modway Aveline 8″ comes with gel infusion that helps dissipate heat away. Hence, sleepers will have less chances of experiencing heat retention. Who should consider this mattress? Modway Aveline 10″ is another option worth your consideration if you prefer medium firm feel. Along with that, it is also cool to sleep due to having been infused with cooling gel. Let’s see more! It is constructed from two layers of foam. The top layer is 3 Inches gel-infused foam that provides contour and cooling feel, meanwhile, the bottom is 7 Inches dense polyurethane foam base. It is firm to prevent sleeper from being sunk too far down the mattress. The cover is a stretch knit fabric. it has the diamond pattern with white tone. This design makes it look nice in general. Along with that, it is breathable and soft to feel. This 10-inch model is designed with medium firm feel. This firmness makes it more supportive to back sleepers than others. When you lie down on it, it will conform to your body shape immediately, and then let you feel more hug. In terms of sinkage, it depends on your body weight. The average weights can sleep on the top instead of being stuck in there. The mattress does come with gel infusion that is helpful a lot in keeping heat retention in under control. Hence, if you are concerning about warm feel, you can feel worry-free. 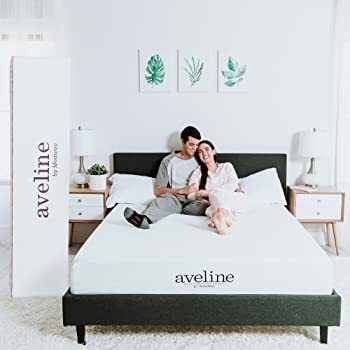 Another option for memory foam mattress belongs to Modway Aveline 6″ model. It has medium firm feel and cooling gel infusion. What else? The construction of this 6-inch mattress has two layers of foam, including 1.5 inches of Gel-infused memory foam, and 4.5 Inches dense polyurethane foam base. The fabric used is a stretch knit type with diamond pattern and white tone. In addition, it has nice feel, soft and breathable features. The mattress isn’t too soft or too firm, which can make side and back sleepers feel supportive. However, some heavier sleepers need to consider carefully before choosing it. Along with that, 6-inch thickness doesn’t make it good in providing deep compression. In addition, if you have a habit of using edges sitting doing things or sleeping on it, this mattress won’t be a nice choice. In general, the mattress can manage to produce cooling feel for sleepers due to having gel infusion. However, the top gel-infused foam used is a bit thin, which means your body may sink and feel the extremely hard base foam. Who should consider this 6-inch model? The Modway Elysse 12-inch mattress is packed with many great features that can surprise you. Especially, it is super cool to sleep on. Let’s dig deeper into this mattress! The construction off this Modway Elysse 12-inch mattress consists of different layers. The top layer is 0.75 inches gel-infused foam that helps keep heat retention in under control. The second layer is 2 inches of memory foam. This will combine with top layer to provide contour. The third layer is 1 inch of responsive foam that can create a little bounce. The next layer is the 6.25-inch layer of individually wrapped coil system. Lastly, to enhance the support, it comes with 1 inch of responsive foam used for at the bottom. Elysse comes with a quilted outer cover that is machine washable. Aesthetically speaking, it looks luxury and aesthetic with its diamond pattern. And, it also has a fiberglass cloth inner cover. In general, the mattress can provide balanced comfort and support. It is firm, but not too firm to cause any discomfort. It is just better at keeping your spine in proper alignment. When lying, it just helps distribute the body weight evenly across the surface, and relieve the pressure points across the body. In addition, the mattress will also be contouring to your body shape and let your body weight sunk a bit. But the medium firmness will prevent your body from being stuck in there. The mattress can produce cooling feel due to having gel infusion. Along with that, the individually wrapped coil system can help air flow through the mattress easily. These result in being supper cool when sleeping on it. 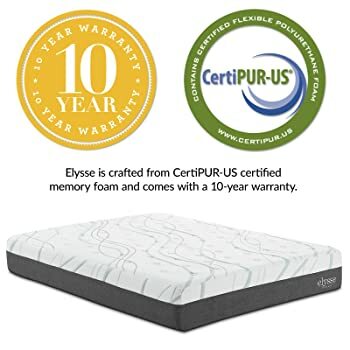 Who should consider this Modway Elysse 12″ mattress? 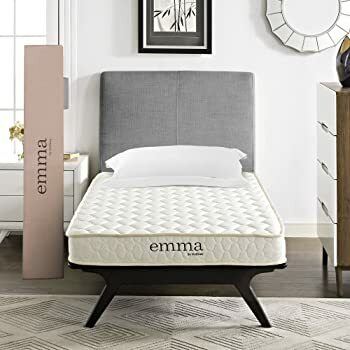 If you are looking for a best mattress for your kid, this Modway Emma 6” Twin Foam Mattress may be worth your considering. It has the moderate level of sinkage, meaning the mattress is designed to be not too firm or too soft. What else does this mattress have? Emma is an all-foam mattress that consists of 0.75 inches of memory foam, 5.25 inches of responsive foam. All layers form 6 inches in thickness. It is a polyester quilted cover. The fabric is thick, which can add an extra cushion to the mattress, but, it is breathable to feel avoid absorbing and retaining heat. The mattress is just great in providing comfort. Though it is built from all foams, it is firm enough to not let sleepers stuck in quicksand. Along with that, it can help distribute the body weight evenly across the surface of the mattress. Hence, sleepers just feel comfortable. There is no cooling gel infusion used for the mattress. However, the heat retention is just kept at bearable level. Who should consider this Modway Emma 6” Twin Foam Mattress?